The burdock plant is a member of the daisy family. It's Latin name is Arctium lappa. It is mainly found in Europe, Northern Asia and North America. It has purple flowers and stands around 4 feet tall. The root of the plant is mainly used for alternative medicine. This is because the root contains all the best bits. The goodness of it can be beneficial to your skin. Especially if you have eczema. Burdock is a great body cleanser, helping to get rid of toxins. It is also a good natural anti inflammatory. 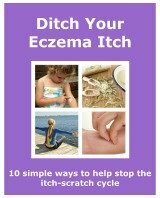 It can help to reduce the symptoms of inflammation that are common in eczema. If your skin is red, hot and sore, then burdock may lessen your eczema symptoms. This in turn will help to break the itch-scratch cycle. Burdock has good anti-bacterial properties, helping to reduce the amount of the bacteria, Staphylococcus aureus, on your skin. This reduces the risk of your eczema becoming infected with the Staph Aureus infection. The oil is also rich in essential fatty acids (EFA). EFA's keep your skin moisturised helping to stop your skin from cracking and breaking. When your skin gets damaged you increase the chance of bacteria entering your skin. The root of the burdock plant can be used in different ways. Tea. It can drunk, or you can leave it to cool and use it as a skin wash. Eaten. In Asia it is cooked and used like a vegetable, commonly used in stir-fries. There are some reported side effects of using or taking burdock. It is recommended that you don’t take it if you are pregnant. You should also always speak to your doctor before starting to use burdock as there are some medications that you are not advised to take burdock with. Burdock is great for helping to remove excess toxins from the body. This could make it good for your kidneys, liver, bladder and for cleansing your blood. 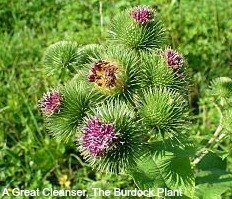 To benefit to them, burdock needs to be taken internally. To help with your eczema, burdock can be taken internally and externally. Taking internally helps rid the body of toxins. Using it externally helps reduce the symptoms of your eczema and aids with healing your skin. The advantage of burdock is that it can help to deal with one of the reasons why your eczema may flare up, and then be a great natural remedy for the ensuing symptoms.